Everyone deserves a Funeral Service and at Cheap Cremations Melbourne we will provide a dignified Cremation Funeral Service for a basic cost of $1600 inc GST. One of the common challenges that families face when preparing a funeral is the costs associated with making arrangements. It should not break the bank to celebrate the life of a dearly departed loved one, which is why we provide cheap funerals in Melbourne and offer very affordable funeral and cremation services. If you prefer cheap funerals in Melbourne, we can help you out by providing you with a simple, no­ hassle service that is convenient for you and tailored to accommodate the needs of your family and friends. Cheap Cremations Melbourne was formed with the sole purpose of providing you with the convenience and the peace of mind that you need to deal with a loss as comfortably as possible. Contact us today to learn more about our service offerings and how we can assist you. Please note that the prices below should be regarded as indicative prices and estimates only. The prices are based on information obtained over the phone, price lists and/or email quotes from Cheap Cremations Melbourne. Prices with an asterisk* are estimated solely on the average prices charged by funeral homes in the state. For more on how we obtain our prices, please see our FAQs. 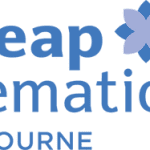 For an exact price quote, contact Cheap Cremations Melbourne using the message form on this page.